Transnet SOC Ltd (Transnet or the Company) has been an active participant in the International Integrated Reporting Council (IIRC) Pilot Programme since its inception and has followed the developments and application of the Integrated Reporting Framework. Our reporting is evolving as the Company's strategic focus, operational priorities and organisational thinking become more integrated, thereby enabling us to remain strategically aligned with and responsive to stakeholders' concerns. The 2018 Integrated Report covers the financial reporting period from 1 April 2017 to 31 March 2018. The boundary of this report (Figure 1) encompasses the Transnet Group, its Operating Divisions and Specialist Units. The boundary further extends to include factors that impact Transnet's ability to create value. There were no significant changes in scope or aspect boundaries, save for the progress made during the year. Where relevant, restatements or changes in measurement methods are disclosed in the annual financial statements. The Transnet Integrated Report is published annually and approved by the Board of Directors (Board). The previous Integrated Report was approved by the Transnet Board on 1 June 2017. This report was prepared according to the guidance of the International Integrated Reporting <IR> Framework, as adopted by the Transnet Board. Broad-Based Black Economic Empowerment (B-BBEE) Codes of Good Practice. Governance terms of reference for the 2018 Integrated Report are contained in Annexure A. We strive to communicate with our stakeholders regularly. Our core values – expressed in our Culture Charter – guide us in our interactions with stakeholders. Superior returns to our investors as a reliable and credible borrower which, albeit state-owned, issues debt on the strength of its financial position without any Government guarantees. The Board and management have applied Transnet's Integrated Assurance Plan to the integrated reporting process to enhance the value- creation narrative, and to provide an independent perspective on the transparency and accountability of our disclosures. Our Integrated Assurance Plan encompasses the assurance provided by management, internal specialists, internal audit, external audit, external advisers and service providers. The Board serves as the last line of defence. Conclusion: Selected sustainability information has been prepared in all material respects in accordance with Transnet's reporting criteria. The 2018 Integrated Report provides information that we consider to be of material significance in creating short-, medium- and long-term value. We have identified 24 material aspects for the 2018 reporting year and have organised these into six clusters. We are confident that the report provides information that is of material interest to all stakeholders wishing to make informed assessments of our performance and our ability to create and sustain long-term value. The impact and relevance of material issues. Process for identifying, validating and approving material aspects. The external auditors issued a qualified opinion relating to the completeness of the identification and reporting of irregular expenditure, including a material uncertainty relating to the Company's going concern in the year under review. The Board reviewed the Group's performance for the year and considered the robustness of budgets and business results, cash flow projections for the 15 months ending 30 June 2019, cost-saving opportunities, the cost of capital projects and related optimisation opportunities, the funding plan and loan covenants. The directors have also assessed the going-concern ability of the Group as a result of the qualified audit opinion. Bilateral and syndicated loans amounting to R15,8 billion have a clause relating to a qualified audit opinion as an event of default. The qualification of Transnet's Annual Financial Statements is an event of default under these financing agreements. On declaration of the qualified opinion, the bilateral and syndicated loan lenders have a right to accelerate their loans which then become due and payable. The Board and management have engaged these lenders to share the nature of the modification, root causes, remedial actions and timelines for remediation. The engagements took place in a positive environment, gaining confidence from the lenders that the partnership with Transnet remains strong, against the backdrop of the strong financial position and cash flow generating capability of Transnet. To date, half of the lenders granted waivers and/or reserved rights to immediate acceleration to allow Transnet the opportunity to implement remedial actions to improve the control environment around the prevention and detection of irregular expenditure.Transnet is confident that an agreement will be reached with all affected lenders to the satisfaction of all parties. A funding strategy has been developed to ensure that the Company is able to successfully fund its capital investment plan without breaching the set financial parameters. Taking into consideration the prevailing difficult economic conditions, Transnet will continue to aggressively pursue specific available project funding areas that are within the parameters of its funding strategy and continue to optimise capital expenditure spend. Further, the Board does not expect the actions by both rating agencies against Transnet and the sovereign to negatively impact the ability of the Company to access the debt capital markets as both rating agencies have assigned a stable outlook for the Company. Transnet has managed to maintain an investment grade stand-alone credit profile amidst a series of rating downgrades. The 2018 Integrated Report aims to communicate the full value of the Group and draws on the interdependencies between financial and non-financial information. We have integrated performance information relating to Transnet's commercial outcomes with that of the nine Sustainable Developmental Outcomes (SDOs) in our discussion on value creation and our performance disclosures. 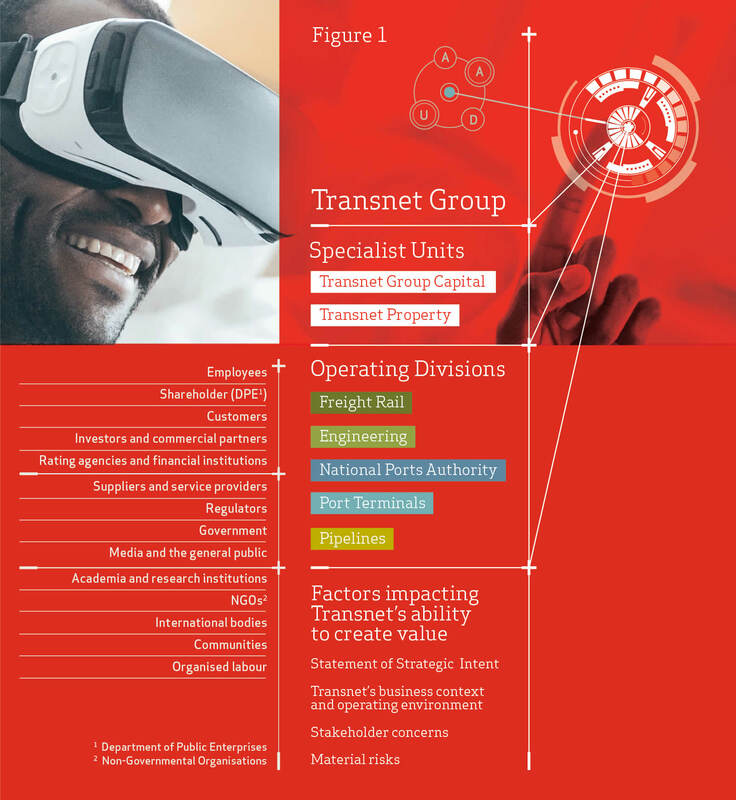 The Board has reviewed Transnet's sustainability performance disclosures in the 2018 Integrated Report for the year ended 31 March 2018, and the external auditor's assurance statement issued to the directors on the subject matters contained in the online Sustainability Outcomes Report 2018 available at www.transnet.net. Our operating context is industrial- and infrastructure-driven, and necessitates occupational training, as well as comprehensive policies and procedures to safeguard our employees, communities within and around our operations and the public. We recognise that our keystone expansion projects – such as our large-scale port infrastructure improvement project at the Port of Durban – need to balance the economic benefits for the Shareholder Minister and the country with the social and environmental concerns raised by surrounding communities. Adverse impacts on local communities include the possibility of social and small business displacement and extensive waste generation during the construction phase. We continue to engage project stakeholders to support the most reasonable, responsible and beneficial balance of outcomes for all concerned. Some of our operations are in water-stressed catchments with resultant risks, including water contamination and water supply shortages. We continue to ensure that water use licences are obtained timeously and are appropriate to the scale and nature of water use. Where water is required to reduce the environmental impact of dust from our Saldanha iron ore terminal, a reverse osmosis plant has been constructed to limit the demand on municipal water by desalinating seawater for use in the terminal. Our operations generate a variety of waste materials as by-products and we strive to implement the principles of responsible waste management, i.e. avoidance, reduction, recovery, reuse, recycling and disposal, if no other use can be found. In accordance with the requirements of section 36 of the National Environmental Management: Waste Act, No 59 of 2008, we continue to identify contaminated areas in our operations using scientific methods and visual site assessments. Management plans are developed for areas contaminated by asbestos and hydrocarbon waste. Pipeline spills present a challenge for the Company and surrounding communities, and we continue to educate property owners and contractors on safe and responsible work procedures; remedial activities include revegetation of sites, excavation of contaminated soil, monitoring of groundwater and backfilling of soil. Transnet's programme to accelerate the modal shift from road to rail is a flagship carbon mitigation programme for South Africa. Rail transport is three to four times more efficient than road transport, offering cleaner, safer, cheaper and reliable freight mobility through improved road safety, reduced road congestion and carbon emissions, and ultimately a lower cost of doing business. As a logistics state-owned company, our large infrastructure development projects pose a risk in terms of ethical and transparent procurement practices and 'rent-seeking' behaviour. Our mandate relies on domestic and foreign investment and perceptions of anti-competitive behaviour and corruption negatively impact our reputation, brand and investment sentiment. Given the challenges during the reporting period, we will continue to work towards greater transparency and accountability, enhancing our procurement practices and stakeholder relationships, and refining our Code of Ethics to ensure the protection of all stakeholder rights. Refining our governance framework to accurately track and address ethical transgressions remains a priority for Transnet. The Board has applied its collective mind to ensure the integrity of the 2018 Integrated Report and any supplementary information referenced in the report. The Board has considered the completeness of the material aspects addressed in the report, and the reliability of reported performance information presented, based on the integrated assurance process followed. The Board is satisfied that the 2018 Integrated Report provides a fair representation of the integrated performance of the Company during the year. Further, it has concluded that the report is presented in accordance with the International Integrated Reporting <IR> Framework and aligns with the King IV guidelines. The report also contains Standard Disclosures from the GRI Sustainability Reporting Guidelines.